To be an environmentalist early in the twenty-first century is always to be defending, arguing, acknowledging the hurdles we face in our efforts to protect wild places and fight climate change. But let’s be honest: hedging has never inspired anyone. So what if we stopped hedging? What if we grounded our efforts to solve environmental problems in hope instead, and let nature make our case for us? 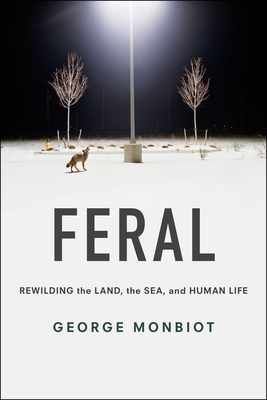 That’s what George Monbiot does in Feral, a lyrical, unabashedly romantic vision of how, by inviting nature back into our lives, we can simultaneously cure our “ecological boredom” and begin repairing centuries of environmental damage. Monbiot takes readers on an enchanting journey around the world to explore ecosystems that have been “rewilded”: freed from human intervention and allowed—in some cases for the first time in millennia—to resume their natural ecological processes. We share his awe, and wonder, as he kayaks among dolphins and seabirds off the coast of Wales and wanders the forests of Eastern Europe, where lynx and wolf packs are reclaiming their ancient hunting grounds. Through his eyes, we see environmental success—and begin to envision a future world where humans and nature are no longer separate and antagonistic, but are together part of a single, healing world. Monbiot’s commitment is fierce, his passion infectious, his writing compelling. Readers willing to leave the confines of civilization and join him on his bewitching journey will emerge changed—and ready to change our world for the better. George Monbiot is a journalist, environmentalist, Guardian columnist, and the author of numerous books. "Monbiot challenges the reader to think more deeply on the subject of rewilding. . . . Throughout the book, Monbiot's lyrical and provocative tales of his efforts to reengage with the wild stimulate the senses and arouse an innate urge to affiliate with nature. . . . Monbiot takes you on an emotional roller coaster, at times plunging you into troughs of despair as he discusses the bleak plight of much of our wildlife and, at others, raising you up on peaks of hope as he discusses how much of the degradation can be reversed. . . . Part personal journal, part restoration ecology primer, Feral popularizes the concept of rewilding and will likely prompt wildlife managers, landowners, policy-makers, and the general public to question their perception of the natural world and its role in our lives." "The world knows George Monbiot mostly from his powerful and perceptive journalism. But this is a whole different order of writing and thinking, a primal account of an unstifled world." "George Monbiot is always original--both in the intelligence of his opinions and the depth and rigour of his research. In this unusual book he presents a persuasive argument for a new future for the planet, one in which we consciously progress from just conserving nature to actively rebuilding it." "Feral has really opened my mind to the history and possibilities of our landscape. It reflects a very real need in us all right now to be released from our claustrophobic monoculture and sense of powerlessness. To break the straight lines into endless branches. To free our land from its absent administrators. To rewild both the landscape and ourselves. It is the most positive and daring environmental book I have read. In order to change our world you have to be able to see a better one. I think George has done that." "Monbiot is at his lyrical best sharing his own very private encounters with the natural world. Then his craving for a 'richer, rawer life' becomes not just compelling but irresistible."